It’s been a little over a year since Final Fantasy XIV: A Realm Reborn was released, and developers constantly impress their players with new content. 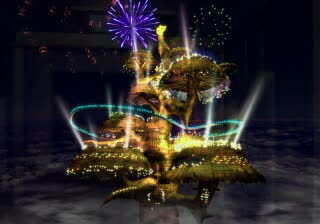 But isn’t it about time we saw something like FFVII’s Golden Saucer? Well, we might not have to wait much longer for that, as word from the producers reveals that one is in the making! What could this mean for FFXIV: ARR? While it still doesn’t have a solid release date yet, Gold Saucer’s development for FFXIV: ARR is already underway. In an interview with Final Fantasy Dream, the game’s director Naoki Yoshida said that the team is working hard to recreate Golden Saucer and wants to make sure that everything is ready before releasing it. Gold Saucer is expected to be released along with patch 2.5. Final Fantasy VII’s iconic Chocobo Racing and VIII’s addicting Triple Triad card game will both be included in the first batch of Gold Saucer’s playable games. The return of Gold Saucer’s classic games will be very interesting to see, but it wouldn’t hurt to see more games in the first batch. Poker tables or slot machines would be nice additions to Gold Saucer. After all, the place legitimately looks like a casino, what with Chocobo Racing as its main feature in FF VII. Perhaps young adults will appreciate slot machines in Gold Saucer too, since most slot titles today are geared toward the young demographic anyway. Instead of creating traditional machines with 7s and cherries on the reels, game developers today create games that are themed with popular TV shows such as IGT’s CSI: Las Vegas and Total Gold’s Wonder Woman title. FF VII’s original Gold Saucer is a solid, enjoyable area that kept fans entertained for hours. Adding adult-based gaming elements to it such as poker and slot machines would probably be nice additions since those who have played FF VII in the past are now old enough to enjoy some Vegas-based titles. Contributor Sophie Thomas is a 23 year old sports and gaming enthusiast. She spends most of her weekends either at the gym or at home playing her favorite RPG games. She currently works as a part time IT analyst in a local firm in Louisville. Instance Gratification 14: Maintenance is Over for Warlords of Draenor…?